my little red suitcase: a give-away! Hello everybody and a wave to december. I've been putting together a lovely give-away for you today. You that has provided much friendship, inspiration and creativity, and also some well needed escape and solace! November was a tricky month here in the little red suitcase house. Much sensitivity abounded, with trying and testing times for all. I'm sure this is also the case for many of you as we juggle all the different aspects of our lives. I'm trying to be present in my life and create something here. I really have enjoyed all your comments and ideas. I try and reply directly back by email, which is why you won't see many replies on the comments. I am sorry if you are a no-reply blogger, as I won't be able to do that! So without further ado, I would like to offer all the stars in my bloggy universe the possibilty of winning these my little red suitcase goodies. 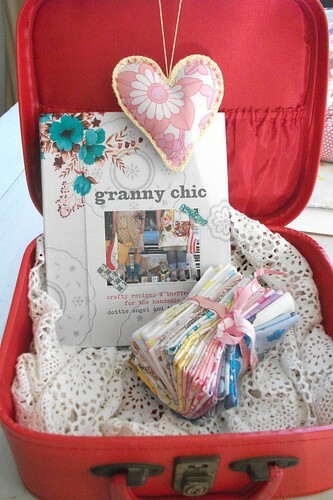 You will find the lovely 'Granny chic' book by dottie angel and ted and agnes. I managed to get a copy at a really good price and immediately wondered who else I could get a copy for! I was sad to note that I could't think of any granny chic loving friends where I live, and made a note to myself to find some!! then I realised it would be fun to put it in a give-away. I will also put in some of my vintage stash squares. There are 18 in total, all different colours. They are 10 inches square and will hopefully encourage some happy making projects. Lastly please choose your favourite heart from below and let me know in the comments. They are happy to travel wherever they need to. Obviously not the suitcase or my lovely crochet cloth, where would I be without those! and it would be nice if it went to one of my lovely followers, if possible. So please follow if you can, and make sure I can contact you. So leave a comment if you would like to join in and remember to choose a heart. I will pull out the winner from my hat on saturday 15th december. Tough times never last,but tough people do! I m sure you are in the tough people category heather:) lovely give away, I m sure would be very lucky to have this. Already a follower of your lovely blog n creations, also thanks for always dropping in a kind word @ diapermum'!s world! What a fabulous giveaway - I would love to win! This is great Heather!!!!! Such beautiful things inside your little red suitcase!!! Love the book, love the vintage squares ( my mind is ready to have a go, so my hands!!) and love your hearts, too!!! The one that I prefer is the heart with the pink edge!!!! thank you a lot my dear!!!! I like your give-away-goodies very much, so I would like to enter. My favourite is the heart with the pink edge. I'd like to enter and if luck is on my side would like the Purple Heart with blue crochet because it reminds me of my bedspread as a child. What a lovely giveaway. I absoultely adore your little hearts. My favourite is the second from right as the fabric is the same as a duvet cover my gran had when I used to stay with her. I saw the Ted and Agnes stall yesterday at the Country Living Fair in Harrogate - they had beautiful things. I cannot decide between the 4th and 5th and then again I like the 2nd. If I really have to choose it would have to be the 4th one with the pretty blue edging. I follow you, but have never commented. I do love your crafty makes and lovely and sometimes courageous ramblings. I too am a stitchy sticher, a maker of handmade happiness and a blogger of sorts. Which heart? Love them all, but if I had to pick, maybe the blue/purple/grey one second on the left. Oooh, glad to find your lovely blog! I am following! I thought i had commented but being new to following and commenting, i am proving to be rather technically inept! I found you through sillyoldsuitcase and am loving all your beautiful makes. What good timing - a fantastic giveaway that ends on my birthday!! I hope this makes me luckier!! All the hearts are great but i can just see a place for the one with the blue trim. What a lovely hearts you make! And thank you so much for your nice comment on my blog. I will send your Jule Guirlander as quick as I can! I wanted to let you know that I have nominated you for the Liebster Award... You can get details here... http://tammychrzan.blogspot.com/. Please include me in your give away, my favorite heart is the pink flowered heart with yellow thread, 3rd from the end.... its lovely! This looks amazing and so generous of you.For the heart I will choose 5th from left.Thanks for the chance to win it. Ohhhh - yes please. I've oggled Dottie Angels book for a wee while now...it looks simple beautiful, as do your hearts. What a lovely giveaway! I love the heart with pink trim. You can contact me at cathd at cox dot net. Hello - thanks for your comments over at my blog - nice to have found yours, especially on the day when you are having a giveaway! What lovely things. Oh I have been wanting to try patchwork for an age, but do not have the pennies to experiment. 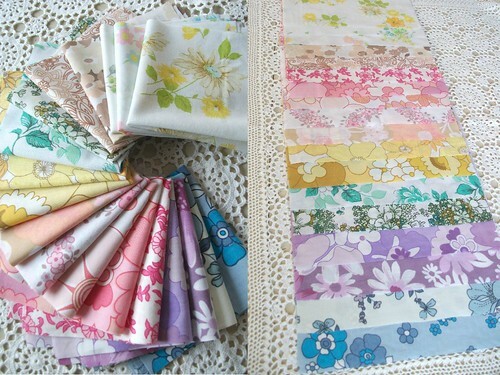 Your fabrics are so pretty and the book is on my secret wishlist. If I was lucky enough to win I would wish for the pale mauvey/bluey one second from the front. And then I would dig out the scary sewing machine from the back of the cupboard! PS, your little red suitcase reminds me of the baby blue one I had many many years ago, ie the 70s lol. Thank you Heather for the opportunity, I'm in!! Hello Heather! !What a lovely giveaway! !I am new following! !I like the pink heart with the yellow edge. Hi Heather. Very generous of you to put together this little package. My favorite heart is the one with the pink edge. It has peeks of pink, yellow and turquoise on the pattern. Sweet. 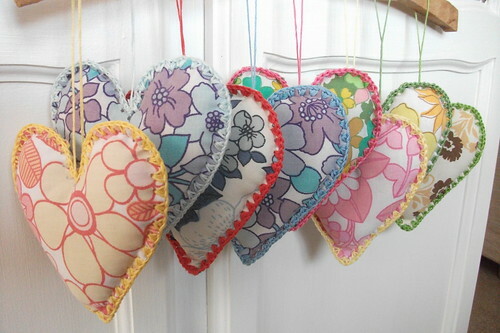 It's hard to choose a favourite heart, I love the green edged ones and the blue and purple ones. Only just found your sweet blog today but I would love to enter your giveaway please :) I adore your hearts, the red edge trim is so cute!